Priyanka Chopra and Nick Jonas hosted a grand wedding reception in Delhi on December 4, 2018. The couple looked great as they posed for the paparazzi. Prime Minister Narendra Modi turned up to wish the newly-weds at the reception in Delhi. The Prime Minister congratulated the couple and gifted them a rose. The Barfi actress was seen introducing her in-laws to Mr. Modi. This is not the first time the Prime Minister has attended a high profile wedding reception. In 2017, Mr. Modi had graced Anushka Sharma and Virat Kohli’s wedding reception held in Delhi and gifted them a rose. 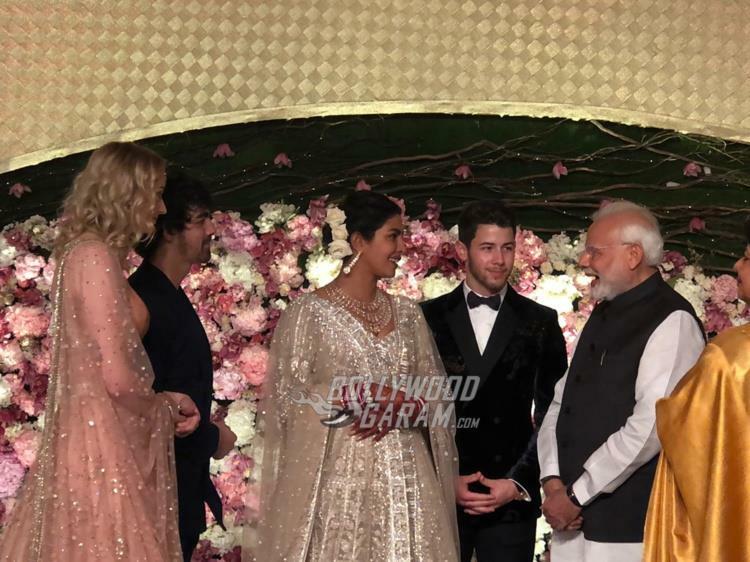 Priyanka for the wedding reception looked gorgeous in a Falguni and Shane Peacock lehenga with beige and white threadwork. The actress styled her look with a matching choli, dupatta worn on both the shoulders, a multilayered necklace and drop earrings. The groom looked dapper in a tuxedo. Nick and Priyanka got married in a lavish wedding ceremony at Umaid Bhavan at Jodhpur. The wedding album was recently shared by the People Magazine which showed the pictures from Hindu and Christian wedding rituals. The actress was walked down the aisle by her mother Madhu Chopra. A video shared by People had shown Nick Jonas getting emotional and teary eyed after watching Priyanka walking towards him.